Think Tank Photo is the premier designer of high end camera bags. Their gear is used by many of the worlds most renowned photojournalists and commercial photographers. They were co-founded by award-winning designers and photojournalists, including the winner of the 2005 Pulitzer Prize. They founded Think Tank because they believe that serious photographers deserve camera bags built to last. They back their gear with a Lifetime Warranty and look forward to serving you. Think Tank has been a Perks partner of the Stockton Camera Club through Meetup for awhile now. Meetup is discontinuing its Perks program so Think Tank offered the SCC the opportunity to be an affiliate directly. 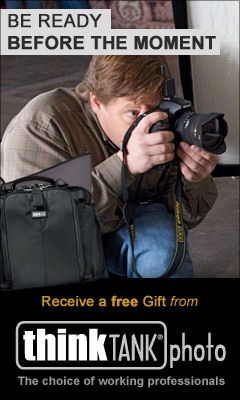 When you order from Think Tank and use the Stockton Camera Club's affiliate code, 140458.92f750, you will receive a free gift with your order of $50 or more (usually a camera bag). By doing so you also help to support the SCC. Clicking on the banner (above-left) or here will take you to the SCC affiliate page that you can shop from which already has the code entered for you. Think Tank will also send the SCC information about new products and promotional offers from time to time.